Today our firm filed an amicus brief for Gun Owners Foundation (“GOF”) and Gun Owners of America, Inc. in the case of U.S. v. Skoien, in the United States Court of Appeals for the Seventh Circuit. 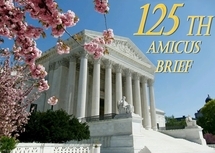 This document compares quotes from the GOF amicus brief with quotes from the NRA amicus brief, which were both filed in the Skoien case —http://www.gunowners.com/gof-vs-nra-quotes.pdf. We filed a brief on behalf of David R. Olfoson, who was convicted and is serving a sentence for “transferring a machinegun,” which actually was a legal but malfunctioning AR-15 rifle. We filed our reply brief, responding to the government’s opposition which maintained that a malfunctioning AR-15 rifle is a machinegun.